When we set out to create Gear VR, and perhaps more importantly Samsung’s new Milk VR service announced on January 5, we did not start by imagining a piece of hardware that you strap to your face. We first imagined what we wanted to see in virtual reality. The possibilities are limitless and unique. Fly a hot air balloon over the Sahara. Ride a helicopter over glaciers in Iceland. Walk around Tony Stark’s lab at the top of Avenger’s tower, interacting and becoming a part of the movie. Surely virtual reality and gaming are synonymous thanks to the amazing work Oculus has been doing. We have long been demonstrating Oculus Cinema as well, which creates a virtual movie theater environment so you can enjoy your 2D video content in a completely new world, whether that’s a home theater, a large format movie theater, or a couple of lonely seats on the Moon. What really has us excited, however, is fully immersive, 360° content. Video that surrounds you. Large screen and curved television sets make you feel like you have a cinema experience in your living room. Large format cinemas like IMAX make you feel like you are surrounded by the image in front of you. In virtual reality, the 360° experience completes the journey to complete immersion. You will feel like you are really a part of the movie. With Samsung’s Milk VR, we aren’t just providing a free app for Gear VR owners. We are creating a delivery system for an entirely new art form. In our vast experience demonstrating Gear VR for users, media, and the public, we have found 360° video to be an easy way to delight viewers early and bring them into the VR fold. Unfortunately, creating a new medium presents new challenges. With such advanced technology, part of that challenge is managing expectations. First let’s establish some bona fides. Gear VR is powered by the Galaxy Note 4, which can play 4K by 2K resolution video at 30 frames per second. This is a very high-end, high-performance specification that was only recently made possible on smartphones. This capability exceeds the resolution and playback of most HDTVs. The Galaxy Note 4 also has a 2560 by 1440 resolution display, which is nearly twice as many pixels as your HDTV. It is a device of impressive power, with a fantastic display that can defy imagination. So why does a video watched through the Gear VR, though at least as high in resolution, appear to be much lower-resolution than other videos and movies viewed on a Galaxy Note 4? When you watch a video on a smartphone screen, it is shrunk to the size of the screen, with its 16:9 aspect ratio proportions, and viewed usually at arm’s length. When you watch a VR 360° video, that image is stretched all around you. It may extend above and below your eye-level perspective. Virtual reality video requires special cameras. 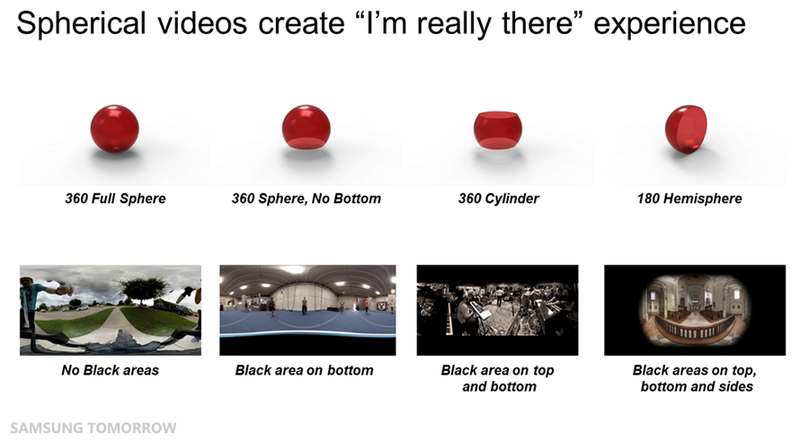 While RED might have become the defacto standard for 4K and 5K 2D video, no such standard exists in 360° VR video. 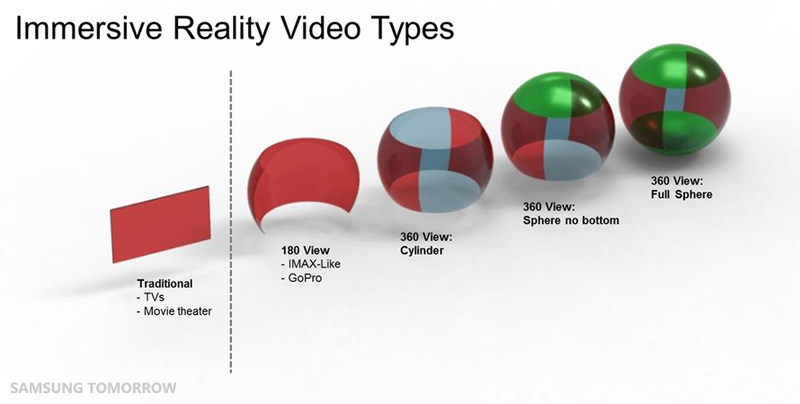 Some companies are using GoPro cameras mounted in 3D printed rigs, and others are actually using RED cameras arranged in a triangle, square or sphere. All of these techniques require post processing work that stitches video files together in an effort to try to minimize the seams between what each camera captured. Others have tried techniques that involve parabolic mirrors with only one camera sensor. This is a creative solution that reduces the number of seams (usually only one), but this sacrifices resolution as the camera only uses one large image sensor, instead of many sensors stitched together. To illustrate the situation, imagine the full potential of a device like Gear VR with a Galaxy Note 4. 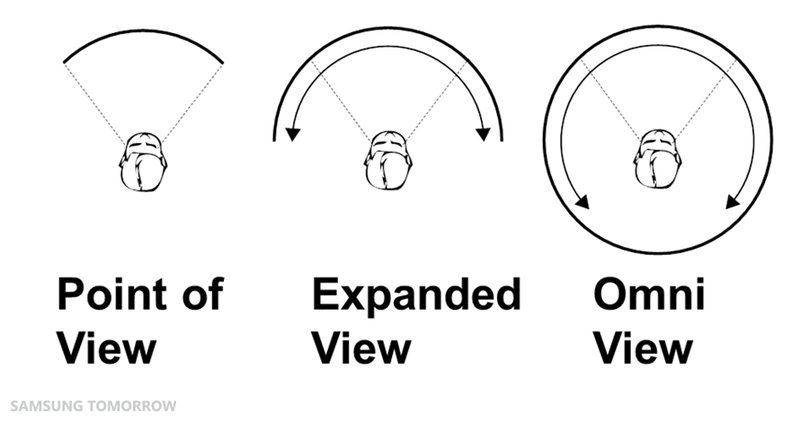 Gear VR can display video for a 96° field of view. That means that one screen-length of the Galaxy Note 4 is equal to about 96° of view. To get a 360° view would take about 4 screen-lengths of the Galaxy Note 4. The Galaxy note 4 screen is 2560 pixels long, so a full 360° video would need to be about 10K resolution just to match the theoretical potential of the display. Eventually the application and graphics processors, the camera sensors and image processors, and the software algorithms that all work together to create and stitch 360° video will all catch up to this potential. By then, of course, screen resolutions will have increased even further, and the technology will still be playing catch-up. We’re keeping an eye on these potential improvements, and other solutions that will emerge to improve the video quality on today’s processors. As such, we’ve made sure Milk VR content has been future-proofed to accommodate this. VR video is not just about technology. It’s about storytelling in a whole new medium. Watch Samsung’s first commissioned VR short film, The Recruit. Check out creative works by artists like Felix & Paul (hyperlink: http://www.felixandpaul.com/wp/) and Chris Milk (hyperlink: http://www.hello-again.com/beck360/main/beck360.html) and others will be showcased at the Sundance Film Festival New Frontiers 2015. As services like Milk VR evolve, providing an outlet and business model to the creative community producing consumer VR content is pivotal, and we can expect to see so much more that will take this technology to the next level. We hope you will join us in the journey.